Yes, I do tend to get obsessed with certain artists to the point that it annoys everyone around me, but what the hell. My current obsession (replacing Zola Jesus, who is certainly worthy of obsession) is Janelle Monáe, and now that I have gotten my paws on her album, Archandroid, and listened to it like a woman possessed, I can wholeheartedly say she is a phenomenon. I get sent a fair few promos and the ones on major labels are rarely my favourites. But Archandroid? It takes me back to listening to Lauryn Hill’s ‘The Miseducation of Lauryn Hill‘, singing with my sisters in the car; it reminds me of James Brown and Outkast; but essentially it’s not a pastiche of Monáe’s favourite artists, it’s a creation all of her own. Archandroid is the story of Cindi Mayweather, an android who comes of age in a futuristic, Metropolis-style world and returns to earth to end prejudice. To me, Cyndi’s story could be compared with that of a minority or oppressed group in society – African Americans; ethnic minorities; gay men and women; transgender people. ; women in patriarchal society; whomever feels outside the norm. Later, in Mushrooms and Roses, Cindi tells us “all the lonely droids and lovers have their wildest dreams” in a club where they can ‘love without fear’. In Wondaland, she describes a land where we can all dress in tuxedos and live in a dreamy, happy state. 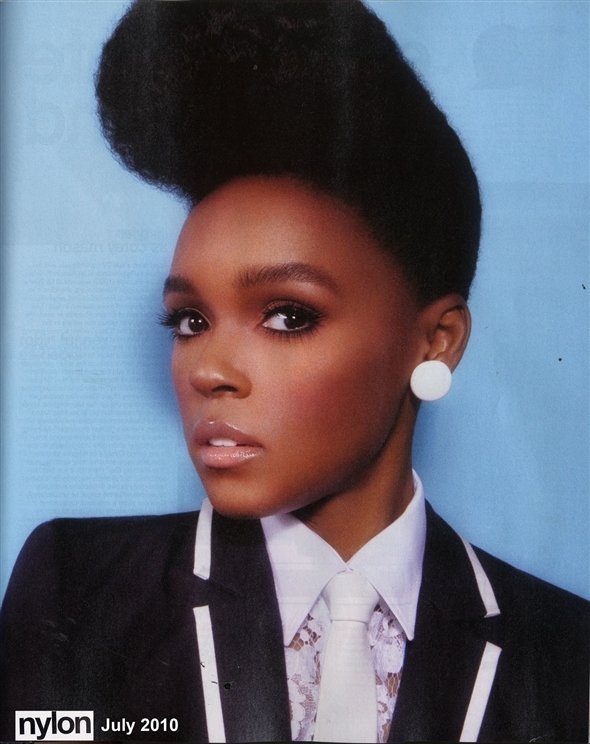 This is an album full of dreams and hopes, and for me it’s nothing short of revelatory that Janelle is signed to P Diddy’s label – he is a man whose previous female artists have always appeared in various states of undress with debatable talent – and has overturned the idea that women in pop have to conform to a narrow ideal. Plus, this is a young woman who has done fashion shoots for Vogue, Nylon and InStyle where her ‘masculine’ sense of style (tuxedos, Oxford shoes, large pompadour), is celebrated rather than being made fun of. But even if you don’t give a hoot about what the album is actually about, rest assured that musically it’s a triumph. Perfectly paced, with dancefloor fillers and introspective, folky moments, it’s this year’s best album so far – and I can’t see anything better being released in 2010. Here’ s Janelle performing a tribute to the purple one, Prince, at this year’s BET Awards. She is AWESOME. Such a great performer and talented musician. And it’s so refreshing when to see someone who actually has someone to say. It really is refreshing! I’m so sick of Gaga etc who are just sold on their bodies and bring nothing new to the table. It’s amazing to finally have someone like Janelle doing so well.